Hepsia's File Manager section allows you to administer the content of your web site using simple point 'n' click actions. 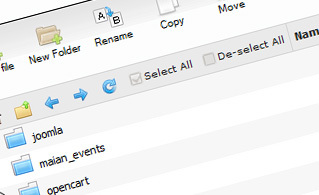 Right-click contextual menus offer rapid access to various file management options, while user-friendly drag 'n' drop functionality will allow you to upload new files from your computer in an instant. You will also find integrated file editors and an image viewer. 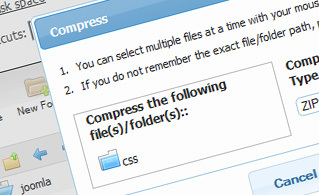 You will be able to compress and uncompress files without difficulty as well. Working with the File Manager feels like working with your computer. The integrated drag 'n' drop functionality will permit you to easily transfer files between your PC and the web hosting server. Simply select the file that you want to upload from your PC and then drag it over to your browser. The same goes for downloading a file from the File Manager to your desktop computer. Moreover, you can download files and even folders to your personal computer by pressing the Download button. With the File Manager graphical user interface, you can create a brand new file or folder with only a single click. 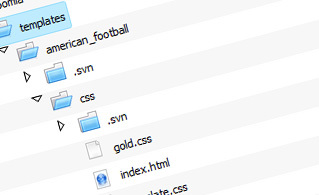 All action buttons are handily located above the file/folder list and you can modify your files without difficulty. You can rename or copy a file, move a file to another folder, explore the contents of a file or modify its permissions, erase a file, etc. With the File Manager, you will be able to pack and uncompress all types of files. It does work astonishingly fast - simply select the files you wish to make a compressed archive of and press the Compress button. You can even select the archive type (.rar, .zip, etc.). It is just as easy to extract the contents of an archive to a chosen directory. With the File Manager graphical user interface, you actually do not need any third-party tools in order to update your files. There is an image viewer, which allows you to examine the contents of your image files to get an idea of how the images will in fact show up on your site. 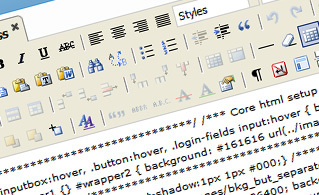 Besides, you will find a set of in-built file editors, which will grant you complete control over your files. The plain text editor and the code editor are designed for more proficient individuals, while the WYSIWYG editor (where you can view all HTML source code changes in real time) is also suitable for technically inexperienced individuals. Irrespective of whether you have a single website or multiple sites hosted in your website hosting account - we have a handy Host Shortcut feature, so you can quickly select only the web site you would like to work with. With the File Manager, you can also use the majority of the famous keyboard shortcuts - click on Delete to delete a file or a folder, or hold down the Ctrl key to select multiple files at the same time.